Glen Miles of Victory Lacrosse is also a strong advocated of the box/field development model. The former Naval Academy All American and Midfield of the Year took some time out to explain why box lacrosse is so important to the development of youth and high school lacrosse players across the country. MaxLaxOC.com: Up until the last few years, box lacrosse was almost non-existent in Southern California. Why is it so important now? GM: Box lacrosse has become important not only in Southern California but throughout the US. There are a variety of factors that brought box to the forefront, such as the proliferation of Canadian box players and their immense success at the college game, and the specific skills that the box game develops more thoroughly than the field game. It is easy to understand why some Canadians are having so much success in college; their outstanding stick skills compared to some US players is most obvious. This separation is likely due to the number of repetitions of catching, throwing, and shooting in the confined space of a rink with walls compared to US players who learned to play on an open field. MaxLaxOC.com: What are the offensive skills that are uniquely developed by box lacrosse and why are they important in the field game? GM: In addition to the stick work repetitions, the growing popularity of sports specialization has reduced the number of multiple sport athletes in Southern California. The game of basketball probably teaches the concept of spacing better than any other. With fewer lacrosse athletes playing hoops, this skill can be taught very effectively in the box rink. Additionally, we are not seeing as much crossover with the sport of football. When I was growing up, over half the football team also played lacrosse. Football does a great job of teaching physical and mental toughness. Playing box lacrosse offers some degree of that training; not a perfect substitute but it helps. Lastly, catching, throwing and shooting in close to the goal under heavy pressure is probably the greatest benefit from box training. MaxLaxOC.com: How about defensive skills? How does a long pole or a defensive midfielder benefit from playing box? GM: Defenseman love to throw checks and try to strip the ball from their attacker. At the highest level of lacrosse this is very difficult to do and defenders are much better off working hard to stay in good position using their feet. Coaches often do drills where they take the long pole completely out of their player’s hands so that the athlete is forced to focus on his feet. Defenders with great feet are much more valuable to a team than those who constantly try to take the ball away. Additionally, with the increasing use of the two-man game, defenders are gaining needed experience in defending that scheme. Again, because of the shorter field and confined space they will see many more reps versus the two-man game. MaxLaxOC.com: How important are box lacrosse skills looking to play high school and college lacrosse? GM: Very important! Many college coaches have begun incorporating box practices and box skills training into their off-season training plan. Players who already have experience playing box will have a distinct advantage over those who have never played the game. For those lacrosse players who have decided to specialize and focus on only lacrosse, the box game is quite different than the field game and it may serve to diversify the player’s training. This will help to keep him or her more focused and having fun while continuing to train and work hard. 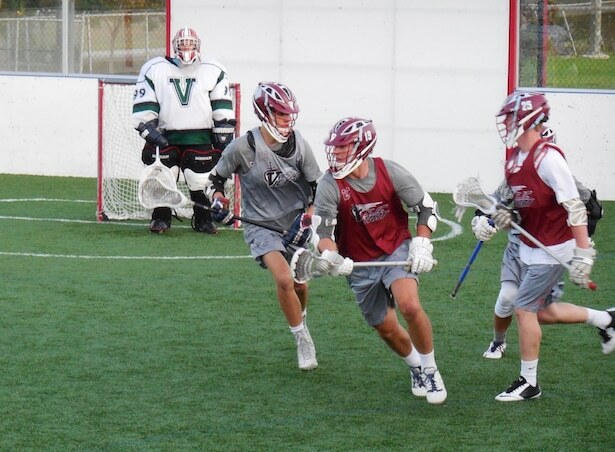 For all of the benefits mentioned above, box is a necessary element to developing an all-around lacrosse player and thus more able to compete at the higher levels.